In my previous post, I talked about how the Job Task Analysis (JTA) Summary Report can be used by subject matter experts (SMEs) to inform their decisions about what content to include in an assessment. In many JTA studies, we might survey multiple populations of stakeholders who may have different opinions about what content should be on the assessment. The populations we select will be guided by theory or previous research. For example, for a certification assessment, we might survey the practitioners who will be candidates for certification, their managers, and their clients—because our subject matter experts theorize that each of these populations will have different yet relevant opinions about what a competent candidate must know and be able to do in order to be certified. Instead of requiring you to create multiple JTA survey instruments for each population in the study, Questionmark Analytics allows you to analyze the responses from different groups of survey participants using the JTA Demographic Report. This report provides demographic comparisons of aggregated JTA responses for each of the populations in the study. Users can simply add a demographic question to their survey so that this information can be used by the JTA Demographic Report. In our earlier example, we might ask survey participants to identify themselves as a practitioner, manager, or client, and then this data would be used to compare results in the report. As with the JTA Summary Report, there are no requirements for how SMEs must use these data. The interpretations will either be framed out by the test developer using theory or prior research, or the interpretations will be left completely to the SMEs’ expert judgment. SMEs might wish to investigate topics where populations differed in their ratings, or they may wish to select only those topics where there was universal agreement. They may wish to prioritize or weight certain populations’ opinions, especially if a population is less knowledgeable about the content than others. The JTA Demographic Report provides a frequency distribution table for each task on the survey, organized by dimension. A chart gives a visual indicator to show differences in response distributions between groups. 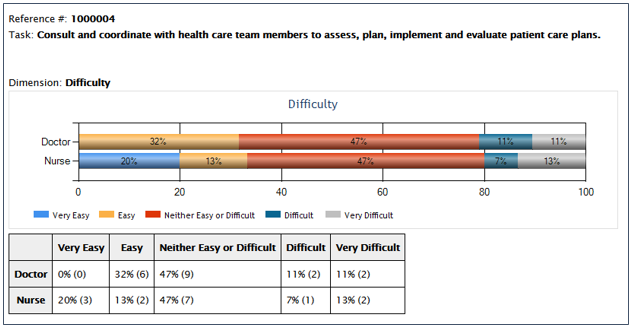 Response distribution table and chart comparing JTA responses from nurses and doctors using the Questionmark JTA Demographic Report.